[2016 Oct] Meningitis teenager shares photos to raise awareness Miss Colechin had bacterial meningitis - which is rarer but more serious than viral meningitis. 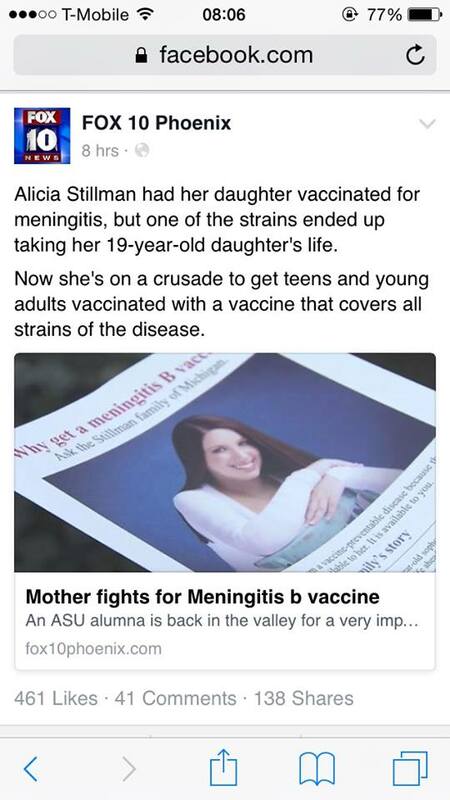 She said she had been vaccinated, but the jab did not protect against the type of meningitis she had. Mum's warning as toddler fights a deadly disease Eli Fapani was fully vaccinated when he contracted the disease, but Ms Palmer said she hadn’t been told what strand of meningococcal her son had. [Media Dec 2002] New military recruit died of meningitis shortly after being vaccinated for it.